This is a food holiday worth celebrating. Here's how to do it right. As if celebrating the fact that it's the weekend isn't enough, this coming Saturday happens to be National Chocolate Caramel day, which gives you perfect license to indulge in all sorts of delicious things: Snickers, Twix and Mars bars; caramel and fudge-swirled ice cream and sundaes; chocolate caramels; caramel-filled chocolate bars; and my ultimate cookie favorite, the millionaire's bar. Here are five of our very favorite chocolate/caramel recipes for this week, next week and every week that follows. 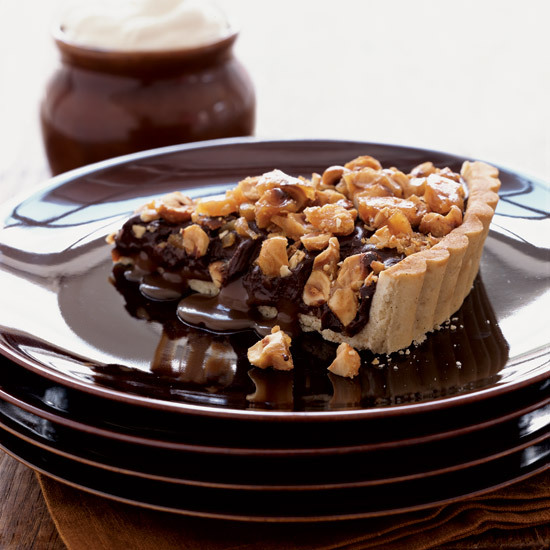 This tart starts with a super buttery thin shell and it's filled with a tender honey-laced caramel that's made with heavy cream. You can top it with a drizzle of dark chocolate, or a mix of dark and milk chocolates, or you can double the chocolate and coat the entire thing in a thick layer of whatever chocolate you prefer. This tart is delicious when it's just made, but it keeps remarkably well in the fridge for 4 or 5 days, if you can keep it around for that long. If you eat it cold, it definitely takes on a candy-like quality—which is a very good thing in my book. 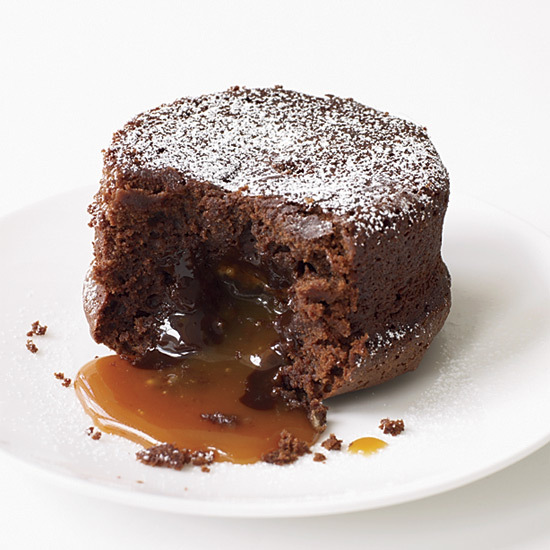 Fallen chocolate soufflé on its own is a wonderful thing, but when you top it with ice cream, chocolate sauce and caramel, it's killer good. If you don't mind deconstructing a recipe, you should know that each of the three parts is a complete standout on its own and belongs in every sweet lover's recipe cache. This dessert is for gianduja lovers, filled with toasty hazelnuts and luscious chocolate, but it's the layer of creamy caramel at the bottom that truly sets it apart. It's especially easy to assemble as tarts go, since the pastry is first baked all the way through and then filled with toppings layer by layer. 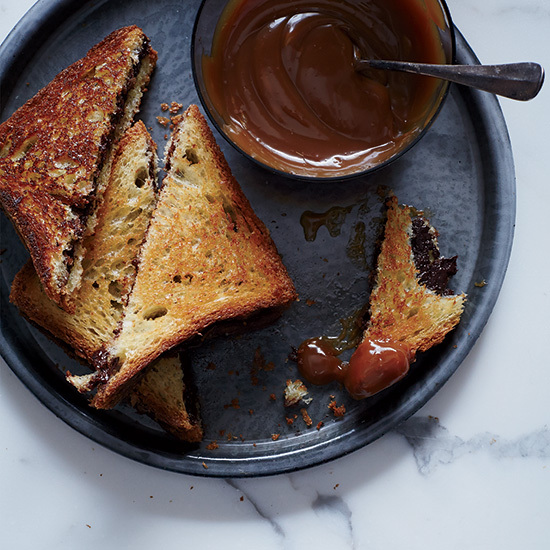 Seattle pastry chef Autumn Martin makes a super dark, fudgy, cocoa-laced spread to slather on her bread before toasting. Don't try to get too fancy with the bread, like swapping in a super dense hearty load or even sourdough. These are best made with a bakery pullman loaf or light country bread for buttery crisp contrast. If you're pressed for time or you don't have a candy thermometer, you could also make these sandwiches with plain, best-quality chocolate bars. These individual chocolate cakes were inspired by the original all-chocolate version made by star chef Jean-Georges Vongerichten. They're quick and easy to make and they look simple and unassuming, but the soft chocolate interior and the luscious caramel spill make for a decadent treat. In the way of accompaniment, I'd go for a scoop of vanilla, coffee or butter pecan ice cream, or softly whipped cream whipped with crème fraiche.